Michael Hugh Hicks-Beach had served as Tewkesbury’s Conservative MP for just over a decade when he was killed in action in Egypt on 23 April 1916. He shared his first name with his father, Michael Edward Hicks-Beach (first Earl St Aldwyn), who had a distinguished political career, holding several ministerial positions. Most notably, he was Chancellor of the Exchequer in Lord Salisbury’s 1885-6 and 1895-1902 ministries. Hicks-Beach was the only son of his two marriages. After following in his father’s footsteps with his education at Eton and at Christ Church, Oxford, Hicks-Beach became his father’s private secretary as Chancellor of the Exchequer. This gave him ‘a good grip of financial problems’ and ‘a knowledge of the inner working of the Parliamentary machine which he turned to good use in later years’. When his father stepped down in 1902, Hicks-Beach travelled overseas, with China, Japan and Korea among the countries he visited. He then served as private secretary to the Conservative Chief Whip, Sir Alexander Acland-Hood. The Hicks family, who took the additional name of Beach in 1790, had long been settled in Gloucestershire. Hicks-Beach’s grandfather, Sir Michael Hicks Hicks-Beach, had sat briefly for East Gloucestershire in 1854. His father had sat for the same constituency for two decades from 1864. He transferred in 1885 to Bristol West, which he represented until his elevation to the peerage in 1906. In 1904 Hicks-Beach was chosen to contest the Tewkesbury division of Gloucestershire for the Conservatives at the next general election. A letter giving advice for his first political meeting at Berkeley that December provides interesting insights into the preoccupations of this largely rural and agricultural constituency. Hicks-Beach was warned that when talking to the elderly Lord Fitzhardinge, he should speak ‘very loud … & slow; not about Motor Bikes & wireless telegraph; & certainly not about Politics’. Safer topics were to ask about ‘the Decoy for Wild Ducks & how many times he hunted last season’. When it came to addressing the voters, Hicks-Beach was told that they did not ‘think so much about what you say, as the way you say it. They want it very understandable’. Hicks-Beach’s victory for the Conservatives in 1906 – in the face of a Liberal landslide across the country as a whole – was helped by his family’s traditional local influence. However, it also owed much to ‘the frank and genial character of the young candidate himself, and the sporting way in which he fought his campaign against apparent odds’. His personality – being described by the Gloucestershire Chronicle as ‘so amiable, so upright, so thoroughly conscientious, so splendid a type of the young English gentleman that his charm was quite irresistible’ – was in stark contrast with his father, whose aloofness and severity had earned him the nickname ‘Black Michael’. Soon after taking his seat at Westminster, Hicks-Beach made his maiden speech on the land tenure bill, and he took a particular interest in agricultural questions during his time in Parliament, where he was regarded as an effective speaker and generally well-liked. He asked several questions in 1906 regarding the military garrison at St. Helena, where he had served as a captain with the Gloucestershire militia during the Boer War. His battalion was responsible for guarding General Cronje and other troops captured at the Battle of Paardeberg in 1900. When his militia battalion was disbanded under Lord Haldane’s army reorganisation scheme in 1908, Hicks-Beach carried the colours at their final parade. He subsequently joined the Royal Gloucestershire Hussars yeomanry (RGH). When the First World War began, he was stationed with them in Norfolk, before going out in April 1915 to serve with the Mediterranean Expeditionary Force. The RGH initially went to Egypt, and Hicks-Beach then saw action with them at Chocolate Hill, Gallipoli, in August 1915, being mentioned in dispatches. 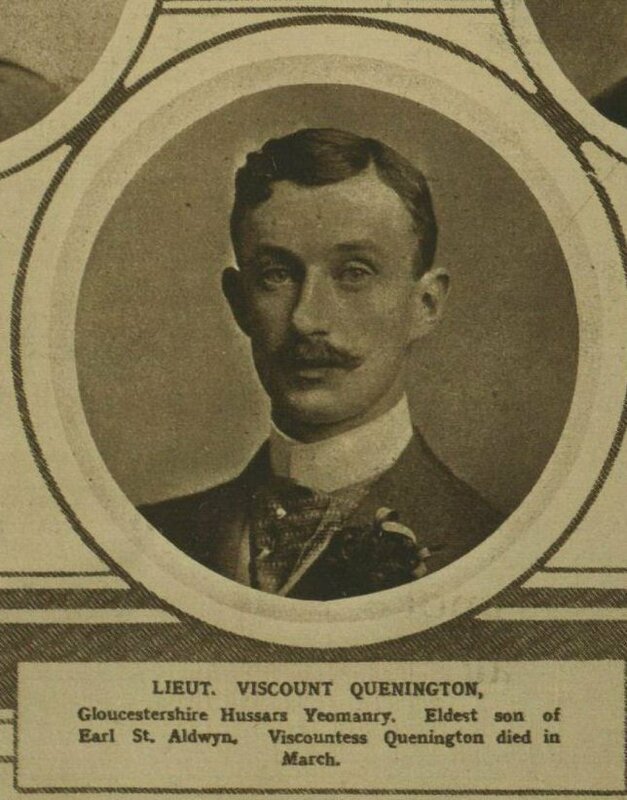 The RGH returned to Egypt, with Hicks-Beach (also known as Viscount Quenington since his father’s promotion to an earldom) as their adjutant. On 23 April 1916, Hicks-Beach was involved in severe fighting at Katia, thirty miles from the Suez canal, where German and Turkish troops (some mounted on camels) made a surprise attack. Heavily outnumbered, the British withdrew (although they had their revenge with an aerial attack on the enemy camp the following day). Hicks-Beach was seriously wounded, and according to one account, was rescued by Corporal William Castle, who ‘under heavy Turkish fire placed [him] across his horse and galloped six miles to safety’. However, he died of his wounds. Unusually for an officer killed overseas, Hicks-Beach was buried alongside his wife, Marjorie, in the Cairo New British Protestant Cemetery. She had gone out to Egypt in late 1915 to visit her husband, accompanied by his sister, Lady Victoria Hicks-Beach. With German U-boats targeting passenger vessels in the Mediterranean, Marjorie and Victoria were forced to stay longer than planned in Cairo. Victoria helped in running the British Empire Nurses’ Club, while Marjorie worked in a canteen for soldiers. Sadly, she contracted typhoid, which led to pneumonia, and died on 4 March 1916, aged 32. Described as ‘a lady of many interests, intellectual and social’, she had taken a leading role in raising money in Gloucestershire for the Red Cross Society. Victoria remained in Cairo until she was able to secure transport home in mid-May 1916. In the meantime, Hicks-Beach’s father, who had been in poor health for some time, died only a week after his son. Hicks-Beach’s infant son, Michael John (1912-92), therefore succeeded his grandfather as second Earl St Aldwyn. He would later serve as Conservative Chief Whip in the House of Lords, 1958-77. Hicks-Beach also left a five year old daughter, Delia. Poignantly, the Gloucestershire Archives hold the final letter she wrote to her father in Egypt, postmarked 19 April, which he never received. This entry was posted in World War I MPs. Bookmark the permalink.